The A.J. Conti Transcendence is a fully isolated turntable, offering the advantages of immunity to outside noise, floor vibration, and other feedback inducing energy that would greatly degrade the sound of other turntables. This turntable will deliver the same state of the art sound in any installation circumstance. We have measured Wow and Flutter of nearly every belt drive and direct drive turntable on the market. Nothing meets the .01% that almost all manufacturers specify. The best speed stability of any turntable other than Basis turntable is .025%, very fine performance, but this is 150% worse than the incredible speed stability of the A.J. Conti Transcendence. Again, the best measured ever for this spec. Rumble: -90db, the limit of the test equipment! Isolation at 60 hertz: 50 db. Isolation at 1000 hertz: 72 db. This is an industry leading number. Total weight of turntable assembly: 158 pounds including Vacuum system and Synchro-Wave Power Supply. Weight of turntable only: 127 pounds excluding Synchro-Wave and Vacuum system. Dimensions of single-arm turntable, L x W x H, inches: 19.675" x 14.5" x 11" to the top of the tonearm. Height to the top of the tonearm wire loop: 14". Total weight of turntable assembly: 166 pounds including Vacuum system and Synchro-Wave Power Supply. Weight of turntable only: 135 pounds excluding Synchro-Wave and Vacuum system. Dimensions of single-arm turntable, L x W x H, inches: 18.375" x 18.375" x 11" to the top of the tonearm. A Transcendence model with two, three and four SuperArms is available as a special order. 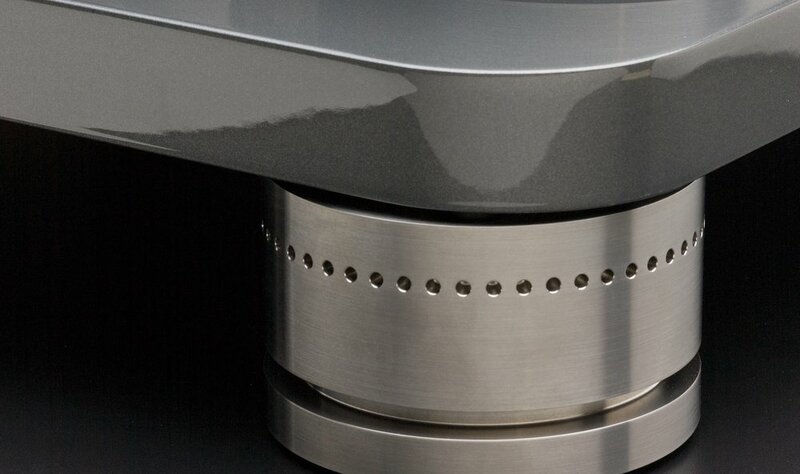 The turntable base on all Transcendence models is currently available with a brushed and anodized finish.